One of the major changes in CGIAR over the past decade has been the full adoption of a ‘research for development’ (R4D) approach. All research projects must be linked to clearly hypothesized impact pathways to solving specific, long-term development challenges, while maintaining high standards of research quality. 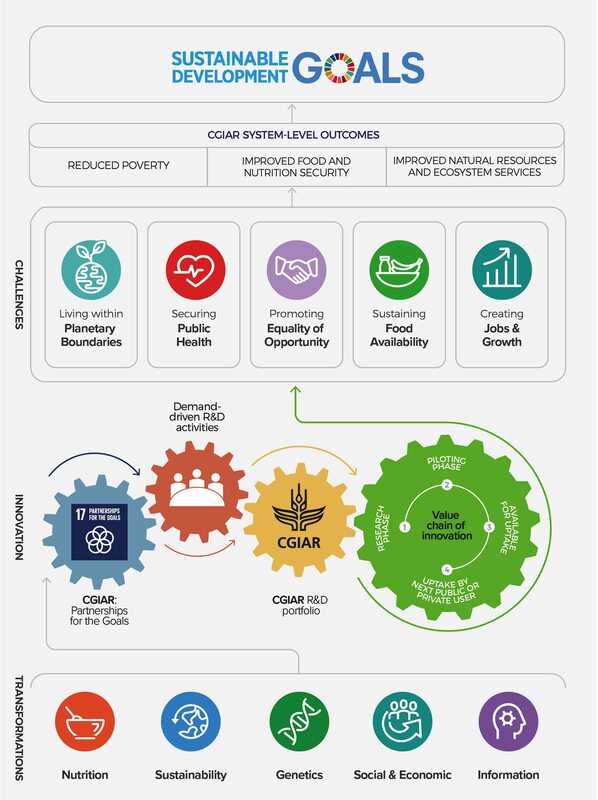 The CGIAR System as a whole reports its progress against an agreed Strategy and Results Framework which has three main System Level Outcomes (SLOs): to reduce poverty, improve food and nutrition security, and improve natural resources and ecosystem services. The SRF also sets out 10 aspirational targets for progress to 2022 and 2030, which feed into the international targets established for the SDGs. Annex Table A lists each of the SRF aspirational targets, depicts how it links to relevant SDGs, summarizes global progress in each area, and then gives evidence based on available adoption and ex-post impact studies published in 2017, on the contribution of CGIAR to each target.1 Because the timeline between initiating agricultural research and ultimate impact at scale is typically 5-25 years, much of the evidence presented relates to earlier CGIAR research. For example, in the first bullet below, rice varieties released around the year 2000, adoption studies were carried out in 2014-16 and published in 2017. However, the majority of current CGIAR programs build on earlier work and may have a similar order of impact. Approximately 9.6 million households adopted improved rice varieties in Africa. An estimated 8 million persons were lifted above the poverty line. The New Rice for Africa (NERICA) rice varieties often benefited women more than men. Nearly 67,000 farmers across four countries in Africa used Aflasafe®, a biocontrol product, to reduce aflatoxin contamination of maize and groundnuts. Aflatoxins are produced by molds that widely contaminate foods and feeds and are one of many “silent” threats in Africa, affecting health, income, and livelihoods. The total estimated number of farming households benefiting from biofortified crops globally now stands at 10 million. In Sulawesi, Indonesia, approximately 637,000 people (52% women) improved their income as a result of adopting tree domestication technologies. Genetically Improved Farmed Tilapia (GIFT) strains of tilapia fish were disseminated in 16 countries. One study found that 53% of production in fish hatcheries in Bangladesh and 40% in the Philippines used GIFT or GIFT-derived strains. More than 1 million tons a year of carbon emissions are likely to be saved if new fire regulations in Indonesia’s Riau province achieve the predicted 50% annual reduction in fires. In Nigeria, about a quarter (24%) of sampled farmers adopted drought-tolerant maize varieties. An estimated 2.1 million individuals were lifted above the poverty line. Adoption on average reduced by 80% the level of downside risk of crop failure, which is critical for food insecure smallholders. A separate nationwide study found that two-thirds of Nigerian farmers adopted improved cassava varieties, and estimated that this led 1.8 million people to escape poverty in 2015/16. 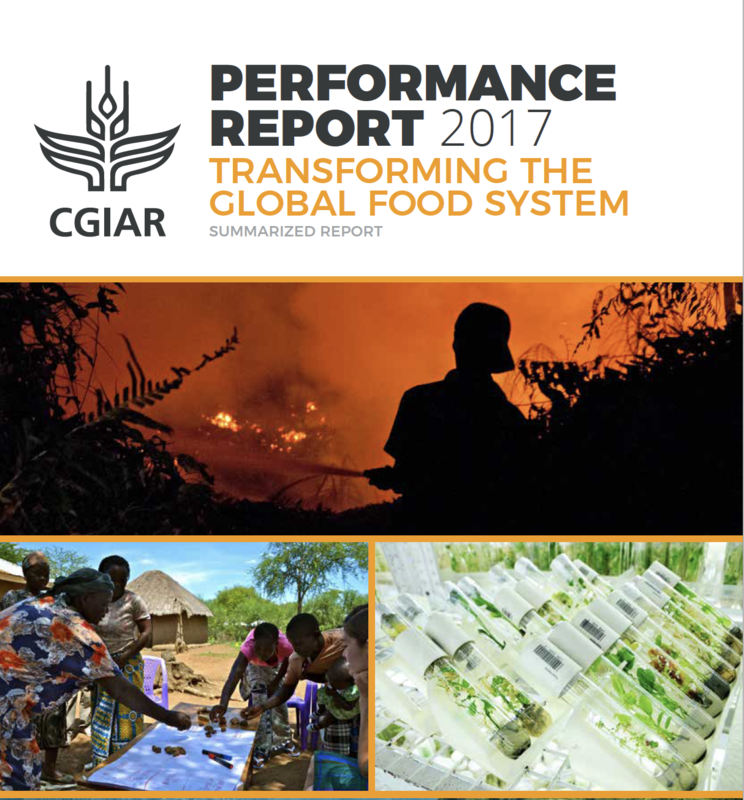 CGIAR is also making a significant contribution to tracking global progress in many of the areas covered by the SRF targets (see Annex Table A), which are often complex to measure. CGIAR researchers are contributing to data collection methods and data on international tracking of nutrition, water use, adoption of crop varieties and innovations, forest cover and climate change. 112 international and national policies, legal instruments, investments and curricular to which CGIAR research contributed in 2017. These are categorized in Table 2, examples are listed in the Box below and a full database is available in Policies/Investments informed by CGIAR Research. 1,961 formal partnerships reported, as described in the following section7. A breakdown by stage of research is given in Table 4, some examples are shown in Table 5 and a list of key partners (not comprehensive) is available in Selected external partnerships in 2017. Source: CRP annual reports and evidence presented to support claims. A list of innovations available for use in 2017 is in Annex Table C, and a full database is available in CGIAR Innovations in 2017. A4NH Project-Level Women’s Empowerment in Agriculture Index (pro-WEAI), a new survey-based index. WHEAT Fhb1/Sr2 recombinant to facilitate breeding wheat cultivars with improved resistance to diseases of Fusarium head Blight and stem rust simultaneously. Note: this is not a “top thirty” but a selection of 2017 innovations, nearly all in Stage 3, ‘Available for use’ (with the exception of high zinc rice, in multiple stages), chosen to demonstrate the range. Source: CRP annual reports and evidence presented to support claims. Full database available here. See more examples and details in the policy contribution database at Policies/Investments informed by CGIAR Research. Source: CRP annual reports 2017 and evidence presented to support claims. Note: These are not a ‘CGIAR top ten’, but have been selected to show a range of interesting publications that have generated considerable attention. They were selected after considering the following criteria: featured in CRP Annual Reports; High Altmetric Scores, in particular Mendeley downloads; High Google Scholar Citation Scores; High Journal Impact Factors; Articles with CRP Lead Authorship or multiple co-authors; Open Access status; balance across CRPs. Capacity development is crucial for CGIAR’s work. CGIAR has a long history of capacity development activities which initially focused on the training of individuals at multiple levels8 but increasingly aim at institutional capacity strengthening and mutual learning between partners. The 2017 IEA evaluation on capacity development in CGIARi found that there remains much scope for CGIAR Centers, Research Programs and the CGIAR System as a whole to improve relevance, comparative advantage, effectiveness and sustainability of capacity development activities. The evaluation recommendations were mainly agreed onii by the System Management Board, which noted the important role of Centers, and the fact that a number of modalities could be explored to improve lesson learning and increase impact through a more strategic approach. CGIAR is committed through its Open Data Policy to make all research publications and data open, and specifically ‘Findable, Accessible, Interoperable, and Reusable’ (FAIR). Efforts to promote Open Data accelerated in 2017 via support from the Big Data Platform. A prototype system was developed that enables a “one-stop” search across 30 or so Center data and publications repositories – an exciting first. 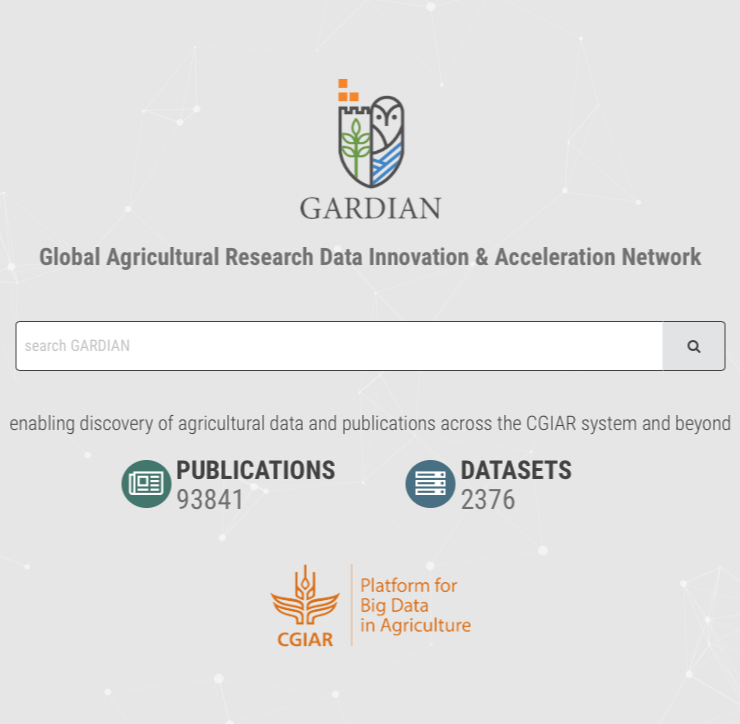 This tool, Global Agricultural Research Data Innovation & Acceleration Network (GARDIAN), enabled access to about 50,000 publications and 1,800 datasets by the end of 2017, an increase of about 15% for datasets from the previous year. Further GARDIAN features are planned for 2018. 1 These figures cannot be summed or accumulated over years, for a variety of reasons including methodology, disadoption or other changes over time, and the possibility of double-counting some people who may have adopted or benefited from more than one CGIAR innovation. 2 For example, only one study in 2017 collected data on women’s dietary diversity (a target indicator). 3 Since the indicators were only fully introduced in April 2018, after the 2017 year had closed, not all could be reported. 4 Data was not available for 2017 on the percentage co-authored with external partners. 5A full list of available Alternative metrics (Altmetrics) scores for CGIAR publications for 2017 can be found in CRP Publications in 2017. 6 This indicator was only introduced at the end of the reporting year, so evidence for the numbers reported is fragmentary. In 2018 this number will be underpinned by a database like the other indicators. 7 This number is likely to be significantly underreported for 2017, since there were cases of multiple partners recorded in one listing. This should improve in 2018. 8 As previously mentioned, in 2017, CGIAR Research Programs reported participation by 348,927 people (40% women) in CGIAR training courses or events, including 1,700 (30% women) on degree or other long-term courses. 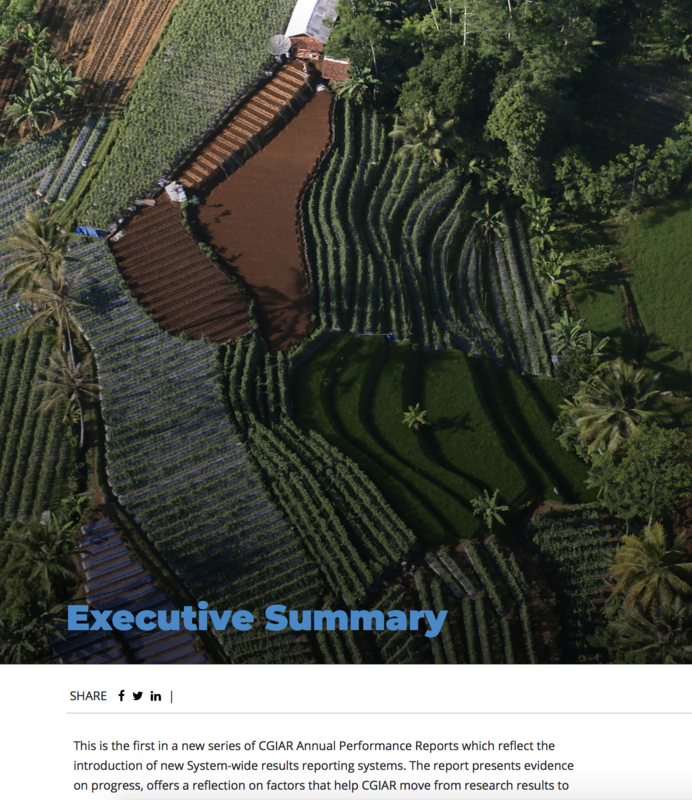 i CGIAR-IEA, “Final Report: Volume I: Evaluation of Capacity Development Activities of CGIAR” (Rome, Italy: Independent Evaluation Arrangement (IEA) of CGIAR, August 2017), http://iea.cgiar.org.